Establishing the T-Post position helps the offense enter the ball to the post more often and gives an offense a spot to facilitate from. Post entries are on the decline in this era of pace and space. Some go as far to say post play is dead. That’s debatable, but the skills required from the modern big have surely evolved. How a player “posts up” has even evolved. Modern bigs are foregoing the tradition back-to-the-basket post up in favor of the T-Post position. In the T-Post position, the posting player has more of a back-to-the-baseline position. Their hips are parallel to the baseline and halfcourt line. 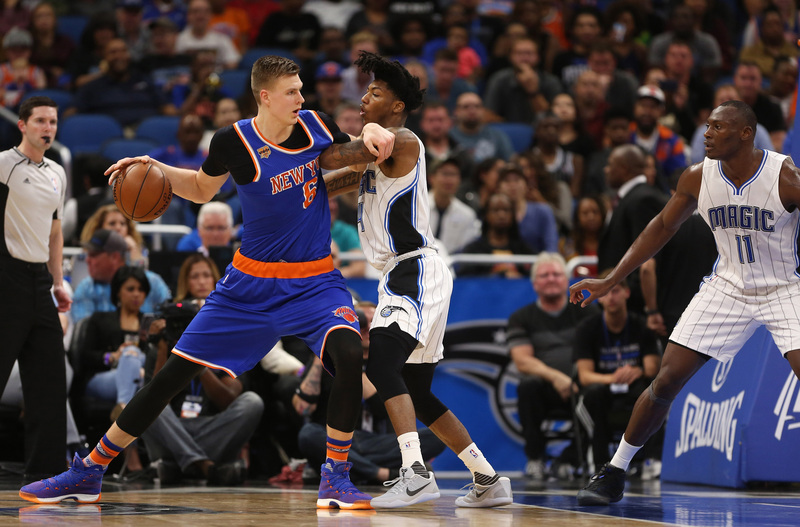 Above Kristaps Prozingis of the New York Knicks demonstrates the T-Post position. 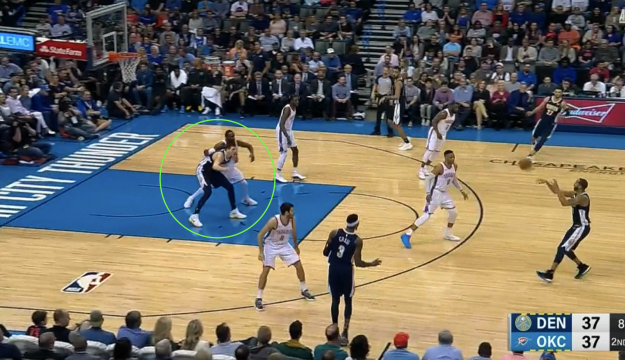 Instead of having his backside buried into the defender, his backside is facing the baseline. The inside arm or the “strong arm” is arm-barring the post defender while the outside arm or the “long arm” is reaching out for the entry pass. The term T-Post refers to the perpendicular nature of the post up. 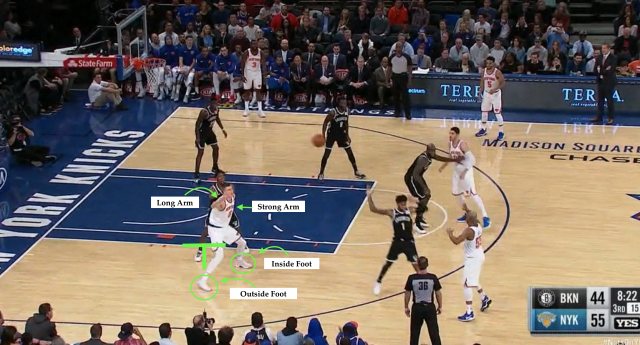 The line formed by the offensive player’s hips and chest is perpendicular to the line formed by the defender’s hips and chest which are parallel with the lane line. The strong arm holds the post defender off and frees the outside half of the player’s body to gather the entry with the long arm. The inside foot should be splitting the post defenders feet. Above is another example from Nikola Jokic of the Denver Nuggets. Jokic has the defender sealed with the strong arm while the long arm is free to accept the pass. Like any tactical or technical decision there are benefits and tradeoffs inherent in the T-Post positioning. As with all technical and tactical decisions coaches should choose what tradeoffs they are willing to live with. The T-Post position allows the ball to be entered to the post player more often. The outside half of the posting player’s body is free thus entry is easier. It is harder for the defense to reach around and deflect passes to the long arm than it is in a traditional post up. It is also more difficult to front the T-Posting player. The tradeoff? You sacrifice possession for a bit of position. It goes in more often but maybe not as deep and in the ideal spot as desired (but rarely accomplished) in a traditional post up. 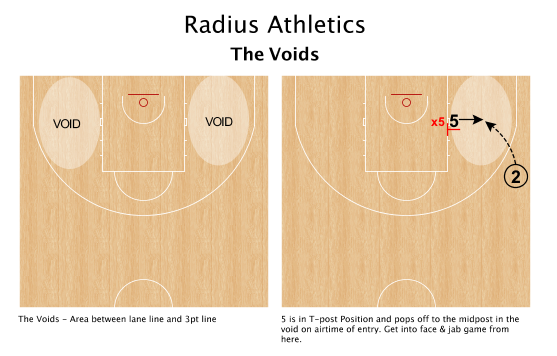 The posting player often catches in “The Void” and must have a midpost game or be able to get back into the paint with and effective move after the catch. The good news they can use many of the same rip and go moves as guards when attacking from The Voids thus streamlining skill development for usage with all players. The T-Post position also allows for better court vision from the post player upon the catch. They can scan the entire width of the court looking for cutters or sniffing out an incoming double teaming defender. With the traditional post up the posting player can only see half of the court. In fact, by utilizing the T-Post position teams can utilize the “throw it in to throw it out” tactic against the collapse-happy defenses they will face. The offense penetrates with the pass and the T-Post player passes out to where the collapse comes from. The post entry compresses the defense and the post can throw it out to the space. 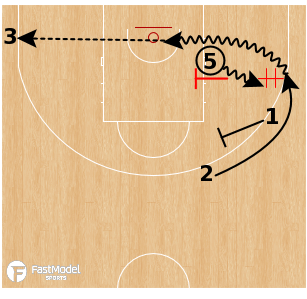 In addition to being a place to score from and eliciting defensive collapse, the T-Post can be a facilitator to off-ball actions from this spot. Here are three such actions. In the diagram above, we see Player 5 with the ball in the T-Post position. 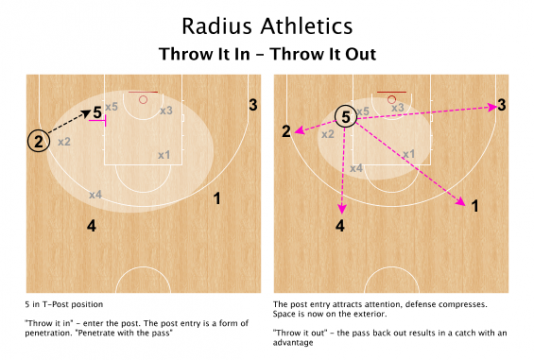 This allows for better vision of the weakside of the court. While some teams collapse on the post more than others, almost all defense will have a few “head-turners” when the ball goes in. If you can cut behind your defender’s head, as Player 4 does on the rip cut above, do it! Above the T-Post position allows for vision of the flare/slip combination. 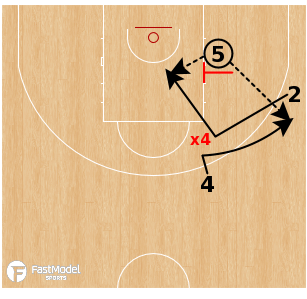 The post player may pass to either the cutter or the screener on the slip. The flare/slip combo helps keep ballside defenders from digging into the post as well. This action is a trademark of the Golden State attack. The flare screen can also free the cutter to take the ball in a handoff from the post. The cutter maybe able to turn the corner and see a drift pass on the weakside if help stops their drive. Modern offense are evolving and prerequisite skills are evolving in lockstep. Basketball will always have a home for tall players, but tall players must have the skill to keep pace in the modern game. Some skill evolution will be drastic and rapid. Some will be just a slight change such as this adjustment to “posting up” in the traditional sense. 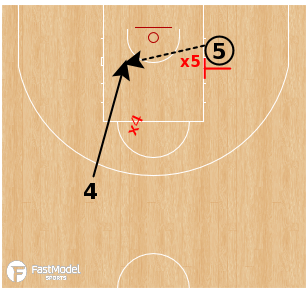 Playing from the T-Post position presents an alternative to traditional post play. Analytics are trickling down from higher levels of play and they are telling coaches things they should pay attention to. Is scoring from the post dead? Of course not, but it may very well require a rethinking of tradition and an eye toward modernization from coaches. Check out #ModernBigTips on Twitter for more on skills Modern Bigs should acquire! For help with practice planning and implementation of these offensive elements for finding, using and creating offensive advantages please contact us and/or join our community for basketball coaches! Any questions, contact us! Happy to talk hoops any time day or night! Sign up here for our twice-monthly newsletter for basketball coaches! Randy Sherman is the owner and founder of Radius Athletics - a basketball coaching consulting firm - where he consults with basketball coaches at all levels on coaching philosophy, practice planning, Xs & Os and teaching a conceptual style of basketball. While a head basketball coach at the the interscholastic level, Sherman's teams won 197 games in nine seasons.